"Winter biking can make your world brighter and more full during the dreary months when that bluish, coldish feeling creeps into the soul and the desire to curl up in a warm, dry spot and wait it out is almost overwhelming. It's counter intuitive but the best thing to do when you feel this way is go outside, your hands may freeze, you toes may tingle, but you will feel more alive, trust me." This was a completely new world to me...I am one of those winter hermits that Ed is eluding to. I thought, is Ed the only man on this earth doing this, or are people all over these cold landscapes biking to deliver the freshest and tastiest ingredients to our doorsteps? 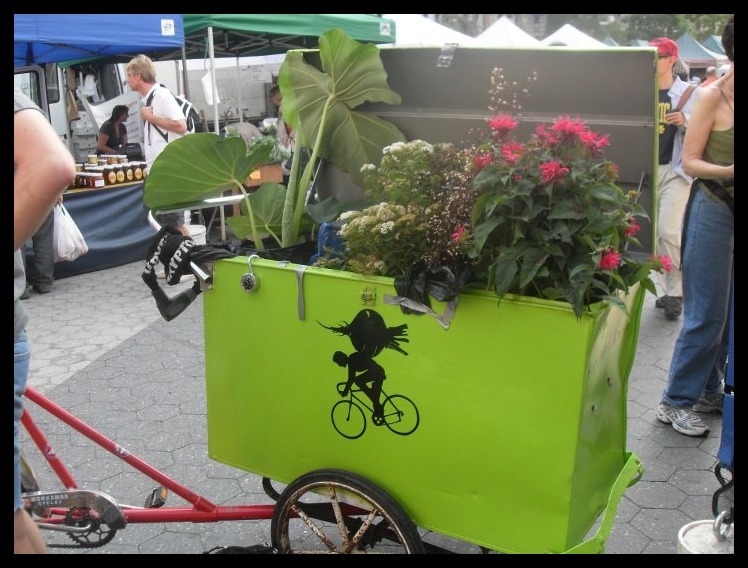 I sent out a Twitter call in December to people who deliver veggies by bike. Over the Twittersphere, I met Christophe Hille, co-owner of the down-to-earth & immensely delectable, Northern Spy Food Co. in New York City's East Village. We chatted, and I asked him, "So you actually bike your veggies from the farmers markets in the winter back to your restaurant to cook?" "Yep" said Chris. "But what about in the Winter, in the snow, in the ice, you do it then?" "Yep" responded Chris, calmly. "So, are there other people out there that do this?" I asked. "Well, in the city, most people do it by bike. It's the easiest way." Okay. Hold up. I'm officially completely missing something. People are carting veggies around all over the U.S....I had no idea. Northern Spy Food Co. shops at the markets, then brings the food back to the kitchen. Turns out, there are many farm and market bike delivery companies that will deliver to your door whether you be a consumer or a chef. Chicago: LoadedBikes.com will deliver your CSA to your door. Minneapolis: VeloVeggies delivers VegBoxes your CSAs to your door. They will even pick up your compost. Vancouver: Recent start-up Green Apple Delivery will shop and deliver to your door. So, I know, you're thinking, I want to try this too. Maybe you want to give it a whirl in the summer, and ease into the whole winter thing. Turns out, there are cargo bikes that can handle hundreds of pounds of local heaven in one go. Ellie of From Earth To Kitchen in NYC recounts one day (while not in the Winter) when they biked 4 whole pigs to a festival on one of their tricycles. They have some sweet things in the works: solar-operated refrigeration for their cargo boxes. 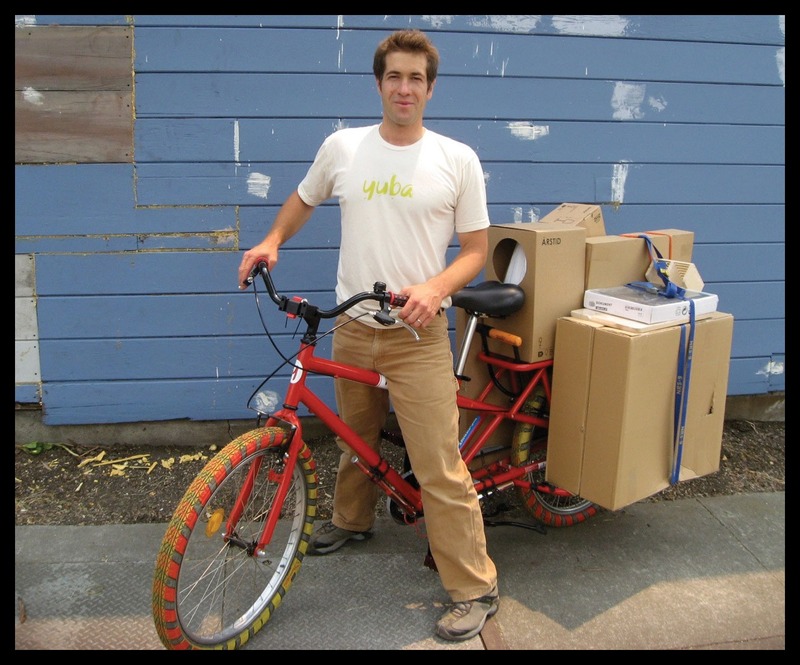 If we're really gonna geek out on equipment, though, you must meet Paul Freedman Founder of Rock The Bike, part owner of Yuba, and yes, he is the bike rapper, Fossil Fool. Good friends with Christophe Hille, he and his crew are building bikes that will seriously blow your mind. 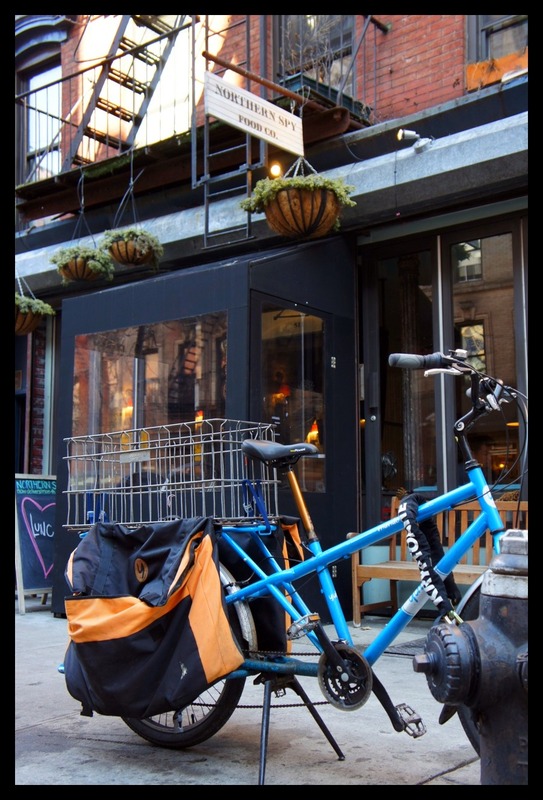 "Cargo biking can be an awesome element in the local food picture, combining our need for activity, community, and exercise, with our need to move serious quantities of food." Turns out he makes cargo bikes that are functional, sleek, and just plain crazy fun. Check out Yuba's Mundo Cargo Bike. Paul has been working on perfecting the Mundo's design for the past 7 years. Paul seems to have more tricks up his sleeve. It turns out he's prepared us to be deliverers and the hostesses with the mostesses. He and his team have designed a series of bikes, Fender Blenders, that co-function as blenders. (Did I mention all the plastic parts in the blenders are made from recycled milk jugs?) The Fender Bender Extracycle is the "creme de la creme" for someone wanting to cart a lot, park the bike, then craft up some smoothies on location. 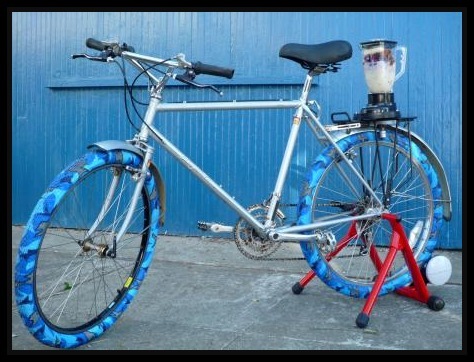 But if you want an option that will just convert the bike you have into a blending machine, then you should check out the Fender Blender Universale. To all those who decided to try something new this year, I highly recommend, letting your hair blow in the wind (but wear a helmet), pick up some food at your favorite local farmers market or farm to table restaurant, and enjoy. 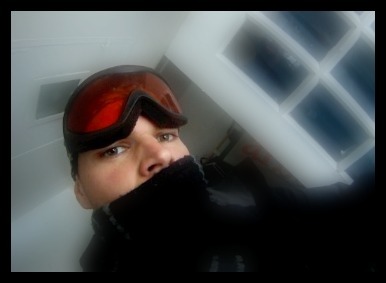 As Ed says "Gear up and may the force be with you."